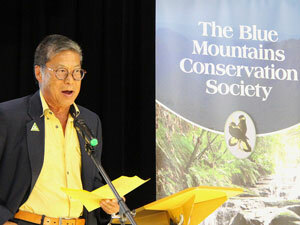 The Blue Mountains Conservation Society conducted two major events for the 2019 NSW State Election. 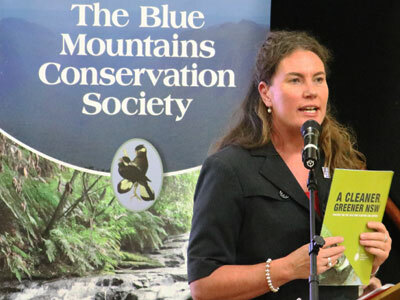 The first was our Cleaner Greener NSW and Blue Mountains Meeting on 31 October 2018. 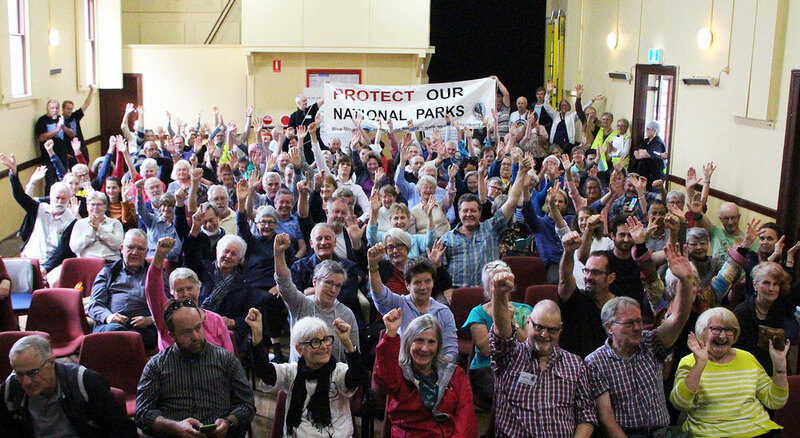 The second was our Rally to Protect our National Parks on 24 February 2019. 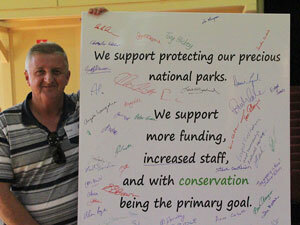 Over 140 enthusiastic community members attended a rally to Protect our National Parks at Lawson on Sunday 24 February. 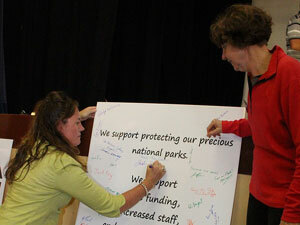 The event clearly demonstrated significant local support for the National Parks and Wildlife Service. 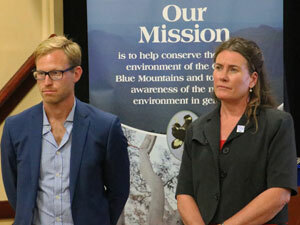 “We wanted to show the candidates in the upcoming State election how much the Blue Mountains community cares about our national parks”, said Society President Ms Madi Maclean. “And I think we achieved that loud and clear”. 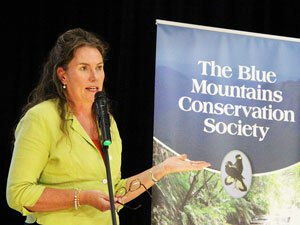 Madi Maclean - President, Blue Mountains Conservation Society. Candidates from all the major political parties were invited to the event. 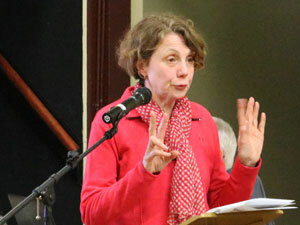 Both Trish Doyle, Labor member for the Blue Mountains and Kingsley Liu, Greens candidate attended and also spoke briefly. 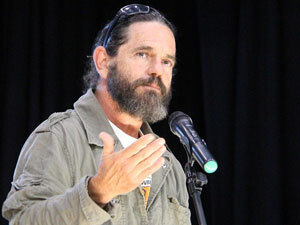 The Animal Justice Party's candidate for the Blue Mountains (Greg Keightley) also attended while Owen Laffin, Liberal candidate gave his apology. 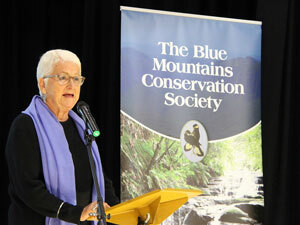 "The Blue Mountains National Park is the most visited national park in NSW, with visitation increasing from 3.1 million to 5.2 million in just 4 years, according to Office of Environment and Heritage surveys”, said Ms Maclean. “It is also forms part of the Greater Blue Mountains World Heritage Area, internationally recognised for its outstanding biodiversity values". As Joan Domicelj so eloquently described the World Heritage Area - “it's a gift from us to the world”, and we have a responsibility to look after it on behalf of all. 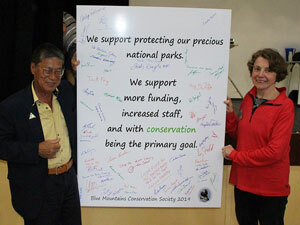 A key concern expressed by all speakers at the rally was that our national parks need to be sufficiently resourced. “However, the National Parks and Wildlife Service, which manages our national parks on behalf of the community, has been subjected in recent years to funding cuts, restructuring and loss of staff expertise.” said Ms Maclean. Click the thumbnail images to see larger ones. 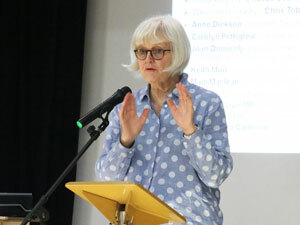 The Society launched its 2019 State Election Campaign on 31 October. 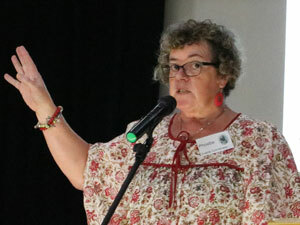 The well attended event in Lawson heard Kate Smolski, CEO of the Nature Conservation Council of NSW present an overview of the key environmental issues across the state, and its policies for the 2019 NSW election and beyond. Download Kate's presentation. [13MB PowerPoint Show]. 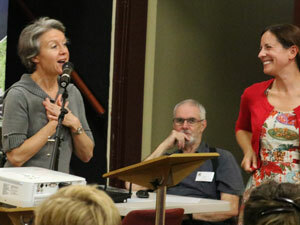 The Society presented its activities and campaigns that are influenced or affected by the NSW State Government's policies and legislation. 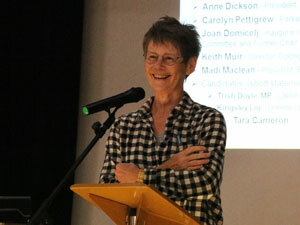 Download the Society's presentation. [14MB PowerPoint Show]. The major parties were invited to send a spokesperson to say a few words at the meeting and to answers questions from the audience. The Greens and Labor accepted this offer. 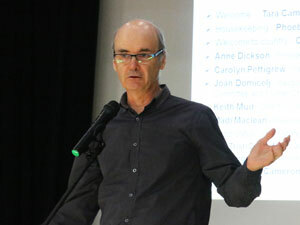 The Liberal’s Owen Laffin attended the event, but was not officially endorsed as their candidate for several days afterwards, and so did not speak at the meeting. Here's the NCC's A Cleaner, Greener NSW - Policies for the 2019 NSW State Election and Beyond document. [13MB pdf]. Click images to see larger ones. 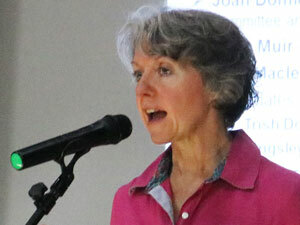 All Images at the Cleaner Greener event by Alan Page.